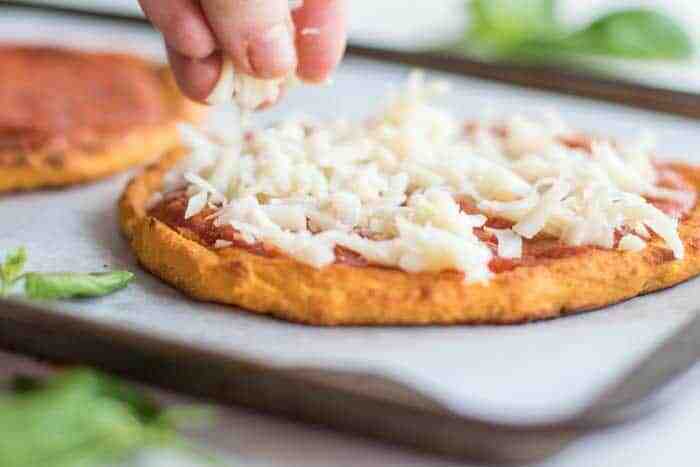 This Sweet Potato Pizza Crust Recipe is reason for pizza lovers to rejoice! It’s a great gluten free pizza crust, and full of nutrients and protein instead of empty calories. Paleo friendly! Why Sweet Potato Pizza Crust? Who out there is a pizza lover? ME, ME! I adore pizza – what I don’t adore is the guilt associated with traditional pizza. Pizza can be a very healthy meal — even made on a standard crust, it’s topped with tomato sauce and protein rich cheese. What makes it unhealthy is taking a white flour crust, topping it with way too much cheese, and then layering on processed meats. Pizza like that is meant for an occasional indulgence! 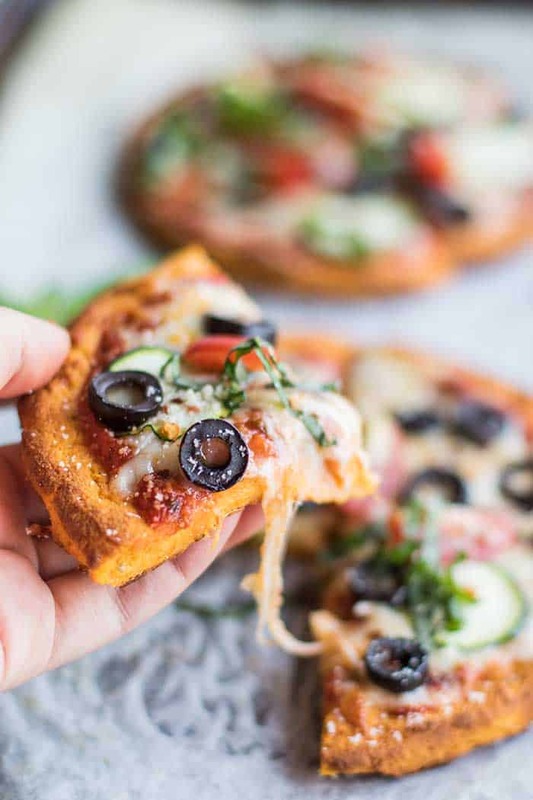 Pizza made on this Paleo Sweet Potato Pizza Crust is made for everyday eating. Layer on the veggies, and you’ve got yourself a pretty balanced meal. My son is a huge pizza fan, but since I am always worried about how to get nutrients into his picky little body, this crust is a great compromise. It’s made from sweet potatoes, almond flour, and eggs – all nutrient dense ingredients (and honestly, almost a balanced meal on its own!). This is great for anyone on the paleo diet, or who needs to eat gluten free. But as with all my recipes — I recommend gluten free options for everyone, because the way I prepare them, they are made to be high in nutrients. I will never base recipes on starches or empty nutrient ingredients just for the sake of making something gluten free. 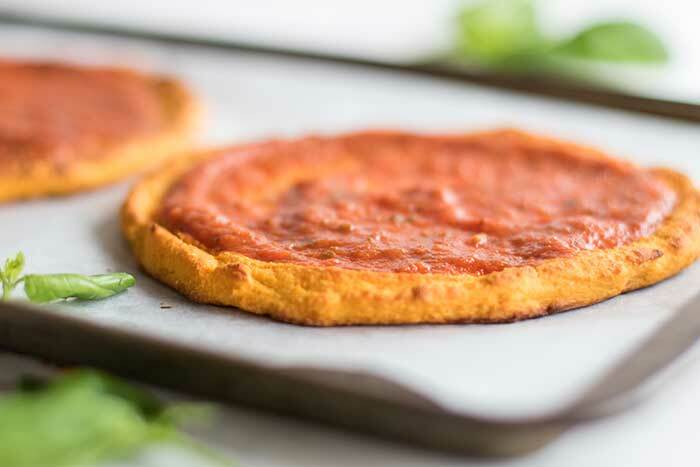 Build your own pizza dream by starting with a healthy sweet potato pizza crust. This crust actually is easier to make than a standard pie crust! No rising. First, I bake the sweet potatoes until they are sweet and creamy. While this takes time, it’s totally hands off. To save time, try baking the sweet potatoes the night before. Once you have your sweet potatoes baked, just add the flesh to a bowl, and beat them with a hand mixer. Add eggs, almond flour, arrowroot, and some spices, and then mix the ingredients well. The tricky part is getting the sticky dough to form a nice pizza shape. You can watch how I do this in the video below. I recommend baking these as “mini” pizzas, about 6 inches round. You can spread this out into a large pizza, but the center of the pizza doesn’t firm up as well as if you bake them as individual sized pizza crusts. 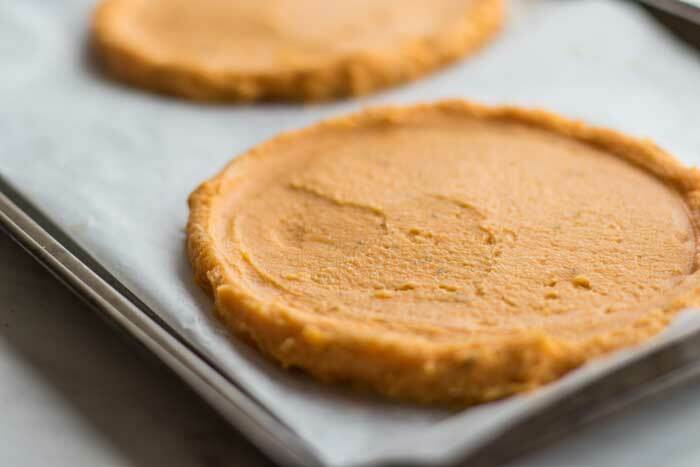 Scoop a heaping 1/2 cup of the sweet potato “dough” onto a parchment lined baking tray. I lightly wet the top of the dough with wet fingers, and then use another piece or parchment on top. Use a flat-bottomed place to press the dough into roughly a 6-inch circle. I like to use my fingers (dipped into water first) to shape the edge into a crust shape, but this is optional. The pizza will taste great even if you don’t take the time to make the perfect crust! After the crust has baked, it is quite firm. The outside of the crust gets nice and crunchy. The perfect healthy pizza crust for hand-holding your pizza! A breath of fresh air if you’ve struggled with making a cauliflower pizza crust. Next, top your pizza with your favorite marinara sauce or jarred pizza sauce. Make your own if you’re feeling up to it! Add cheese if you’d like, or omit it for a vegan or Paleo pizza crust. Depending on how you top these, they will take anywhere from 10 minutes – 20 minutes to bake after topping. I top them simply for my son and they cook very fast. The other night I loaded our pizzas up with zucchini, olives, red bell peppers, spinach, pineapple, and basil. The perfect Mediterranean pizza, loaded with so many veggies I didn’t feel the need to serve a salad on the side. They were delicious — but because I had topped them with so many ingredients, they took 20 minutes to bake. 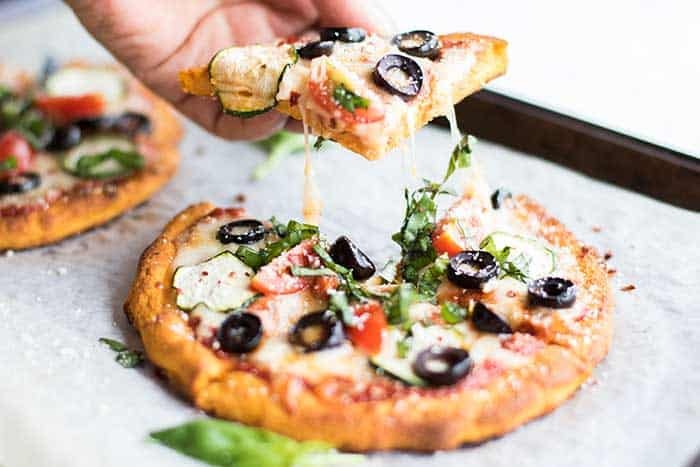 I love healthy recipes that freeze well, so after making this delicious gluten free pizza crust, I was dying to know if it would be just as good after freezing it. Make extra crusts, and after they’ve cooled, freeze them in a freezer ziplock bag. I place a piece of baking paper between each crust, and then when I’d like to make one, I can just pull it out and place it on a baking tray. To Reheat Baked (and Topped) Pizzas: Since this recipe makes 4 mini pizzas, you might have some left over! Refrigerate leftovers for up to 3 days. To reheat, preheat oven to 425 degrees F, and place pizza on a lined baking tray. Bake for 10-12 minutes until the cheese is soft and bubbly again. To Bake a Frozen Pizza Crust: Remove (baked) frozen pizza crusts from the freezer, and preheat oven to 425 degrees F.
Bake pizza crust (with NO TOPPINGS!) for 10 minutes. Remove from oven, and top pizza crust as desired. Bake again for 12-20 minutes. If just topping with cheese, 12 minutes is enough. If loading up with tons of toppings, it will take longer. You can top the crusts directly out of the freezer and bake them, but I found that the centers of the crusts are a bit soggy if you don’t reheat them in the oven prior to topping them. I recommend baking the crusts to firm them up prior to topping them for the best results! Make it Gluten Free: This recipe is gluten free as written, and is a fantastic choice for anyone following a gluten free diet. Save time: Bake sweet potatoes ahead of time to cut down preparation time. Make it Ahead: These crusts freeze beautifully! Read the freezing/reheating instructions above for tips! Make it Vegan: If you need your crust to be vegan, sub the egg for 1 tablespoons of flax meal soaked with 2 tablespoons of water. Allow the mixture to “gel” before adding it to your pizza dough. The end result is delicious, but not as firm as when made with an egg. Make it Paleo: This gluten free pizza crust is Paleo, so make your pizza without cheese for a fully compliant meal. 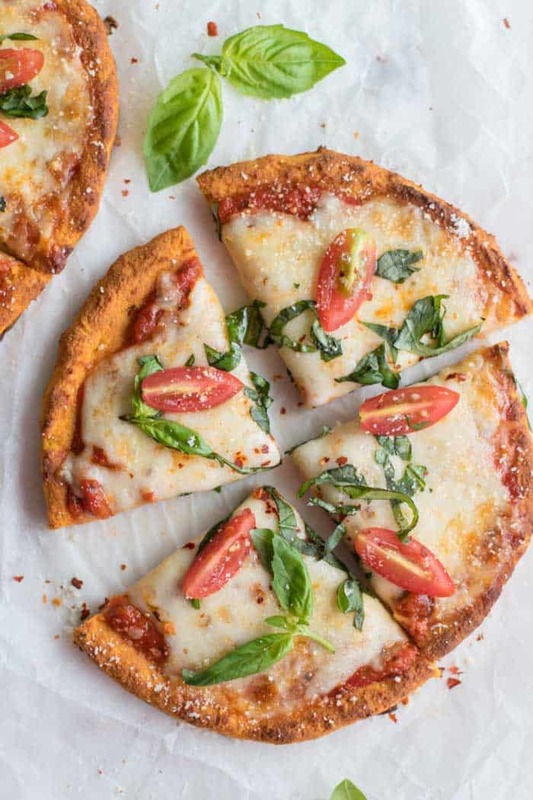 This delicious gluten free pizza crust is for everyone! Perfect for anyone following a paleo or gluten free diet, but also a great option for anyone who is looking to eat healthier. This crust bakes up crispy around the edges, and firm enough to hand-hold slices. Although the crust is softer than a standard pizza crust, it's a delicious alternative! Roast sweet potatoes. I roast my sweet potatoes at 420 degrees F for 1 hour - 1 hr. 20 minutes, until they are very soft. Once potatoes have cooled, scoop out the flesh, and measure out 2 cups of sweet potato puree. In a large mixing bowl, add sweet potatoes, and use a hand mixture to whip the sweet potatoes until they are smooth. Add the rest of the ingredients, and use the hand mixer again to mix well. Line a cookie sheet with baking paper. Scoop "dough" in heaping 1/2 cups (the recipe will make 4 small pizza crusts). Wet your fingers, and lightly press down on the top of each mound. Cover 1 mound of dough with another piece of parchment, and then use a flat-bottomed smooth plate to press down until the sweet potato is about 6 inches in diameter. Watch this process in the video above. I like to use wet fingers to gently mold the edges of the crust, but this is optional. Bake the crusts for 30 minutes. Top the crusts with sauce, cheese, or other toppings, as desired. Return topped pizzas to the oven for 12-20 minutes, depending on how many toppings are added. A basic cheese pizza will bake in 12 minutes, but a pizza loaded with tons of veggies will take 20. For instructions on freezing and reheating pizzas, read notes in post above. This Sweet Potato Pizza Crust post may contain affiliate links, meaning if you make a purchase, I will receive part of the sale as a commission. This helps me continue to bring you lots of fresh and inspired recipes! Wow this is so creative I need to try it soon! I love sweet potatoes intrigued on the consistency and application for a pizza dough. Send me a slice. Wouldn't it be amazing if there were fast food places that sold banana soft serve and sweet potato pizzas? I'd totally pay more for better ingredients! I have tried cauliflower and broccoli crusts before, but not sweet potato. Definitely giving that a try. I love all pizza. I love pizza too, Dannii! Love that these are freezer friendly! I'm all about making big batches of everything and freezing. It sure makes life easier, doesn't it?! I'm definitely trying this, thanks so much! I love the flavors of sweet potato with pizza! It is an amazing combination. The crusts actually turned out less "sweet potato-y" than I expected, if that makes sense. The other ingredients tone down the sweetness. Such a wonderful combination! I am sure you can use more almond flour -- I typically like to use arrowroot because it helps gluten free baked goods get crispy around the edges, and they usually end up softer than not using it. Tapioca flour is nearly the same thing as arrowroot, so that can be used instead. If you have organic corn starch, that's another good sub. I'd love to hear how you like these! (Also, plain white flour is a sub if you don't need these to be gluten free). This recipe is great! These were easy to make and surprisingly tasty- I'll make this again soon! am i able to boil potatoes instead of roast to take away some cook time? You most likely can, but I haven't tested it. The reason I chose to roast them is because it reduces the moisture in the potatoes, and boiling them don't do that. 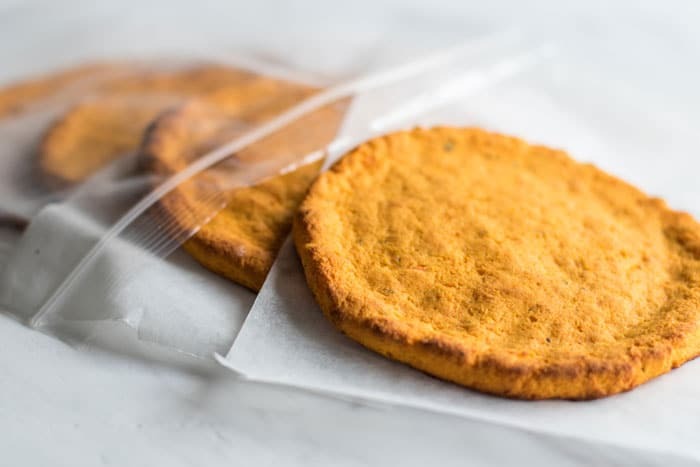 Another time saving tip is to microwave them for 4 minutes, wrap in foil, and bake for 30 minutes. This method I have tested. I did try to make them fully from microwaved sweet potatoes, and it did work, but the texture wasn't as smooth and I didn't like it nearly as much as when the potatoes were evenly roasted. When I microwaved them, the end result turned out more "potato-ey", if that makes sense! Let me know if you try boiling them! One option that I can see working is adding an extra couple tablespoons of arrowroot to try to take out some of that moisture. Can I substitute something for the almond flour? I don't have to be gluten free, though I prefer to be when possible. Could I use some organic spelt? What else would work? Thanks! That's another very good question. My best guest is you could sub pretty much any flour - whole wheat, spelt. 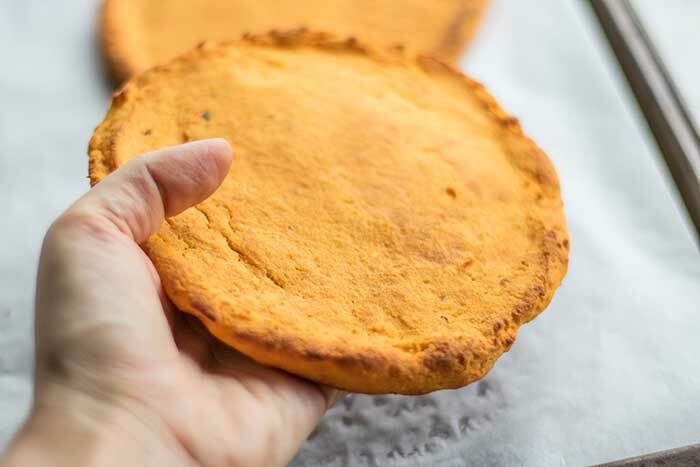 The main ingredient in here is sweet potato, so it probably doesn't matter a whole lot what you use as a binder (not coconut flour - to absorbent and unpredictable!). If you'd like it to be gluten free, I'd try using rice flour -- or gluten free oats ground in a blender. Whatever you try, please let me know how it worked out! Hi Michelle,Getting ready to try this recipe and I am wondering if you have a preference as to where you get your flours & arrow root? I've tried Bob's Red Mill in the past.Love the new site by the by! Thanks Angela! I love how it turned out also. I buy Bob's Red Mill flours and arrowroot for 2 reasons -- one, they are the only product I have consistently available to me in Malaysia. Two - they are consistently good. I am sure there are lots of great options in the US, but I am not the expert on them! I have bought different brands on arrowroot in the States, and found them to have a very strong flavor, which is another reason I stick with Bob's Red Mill (plus, it's a great price. You buy a large bag, but it will last you a long time!). Made it, like it, will make again! I used tapioca starch in place of arrowroot, turned out good. I like better than cauliflower crust for sure! So glad to hear that Laura! We adore these crusts. I have them in my freezer at all times now. Tapioca starch is basically the same thing as arrowroot, so it was the perfect substitution. I buy arrowroot simply because I've read people with sensitive systems (like mine) have less of a reaction to arrowroot because it's made from 1 root rather than a variety of roots. Wow Laura, thanks for letting me know! We absolutely love these. I love the idea of making a calzone out of them -- bake them first and then fold them over? I am not exactly sure how you'd get them to stick together. Please do let me know how they turn out! Thank you for such a thoughtful comment! I have had so many people reach out to me about this recipe. I am completely in love with it, and love hearing it is working well for others too! I am totally with you about it beating out the grain flour crusts -- I have never made one I really liked. I just made these as a flatbread and they're awesome! Thanks for the recipe! Thank you so much for letting me know, Hanifia! We adore these. I almost always have them in my freezer for pizza cravings! Hi Jo! You will love these pizza crusts. I have had someone tell me they made them with a flax egg and that it worked well - but I have no tried it myself! My other pizza crust also has an egg. I have food allergies so I know how frustrating it can be to always be adapting! Please let me know if you try these! Just made this!!! Oh my word it is so yummy!!!!! 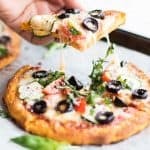 This will be my go to Pizza recipe!!! Love love love!! !